Along Pine Creek, two tunnels are found on what was once the mainline for the Baltimore & Ohio Railroad between Pittsburgh and Chicago. There are indications of a third tunnel near Glenshaw Glass Co., but that structure has been "daylighted" -- the roof removed and converted to a cut in the hill. 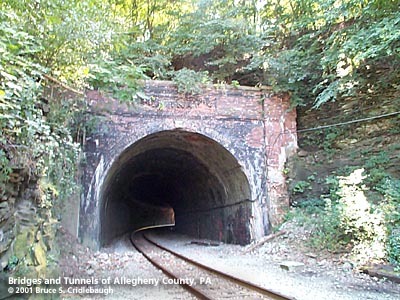 The two tunnels on Pine Creek and the B&O's Whitehall Tunnel in Pleasant Hills share similar design and details. Each has brick portals and brick vault interior with recessed safety bays. The Whitehall Tunnel is more ambitious in length at 1,630 feet. The Pine Creek tunnels merely cut through smaller hills to straighten and shorten the rail line which generally followed the creek. North of Etna at Undercliff, Pine Creek made a horseshoe bend around a rock outcropping which had been an inconvenience to travelers. It had been chipped away and cut through in small places to allow the Butler Plank Rd and Saxonburg Blvd pass. The railroad took an even more direct approach in cutting a 424.7 foot tunnel through the rock. Pine Creek has been a flooding menace. One more recent effort involved cutting away much of the remaining rock outcropping. The excavation left a waterfall shortcut which diverts more than half of the flow from the original horseshoe bend creek. Most other remains of the hill were leveled for a shopping center inside the horseshoe. The portal of the Etna Tunnel includes the word "ETNA" spelled out in a rough geometry required by the medium of brick. A stone on the portal of the Etna Tunnel notes the date as 1903. The 1876 atlas shows the tunnels -- indicating they were rebuilt, probably enlarged. The line was begun as part of the Allegheny and Harmony Railroad in 1872. The narrow gauge railroad was incorporated under the name Pittsburg, New Castle & Lake Erie Railroad in 1877. After a sheriff's sale, it became part of the Pittsburgh & Western Railroad Company which consolidated several lines north and west of Pittsburgh, converting the railroad to standard gauge. It was taken over by the Baltimore and Ohio Railroad in 1893.